A peculiar festival in Japan that changes its appearance during the day and night. During the day, the yamakasa floats are in their original form called nobori yamagasa, and decorated with beautify gold and silver embroidery. 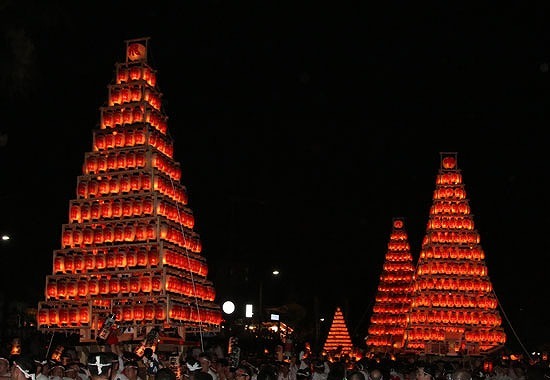 At night, the ornaments are removed and the floats are transformed into 12-tier pyramids covered in 309 chochin lanterns. 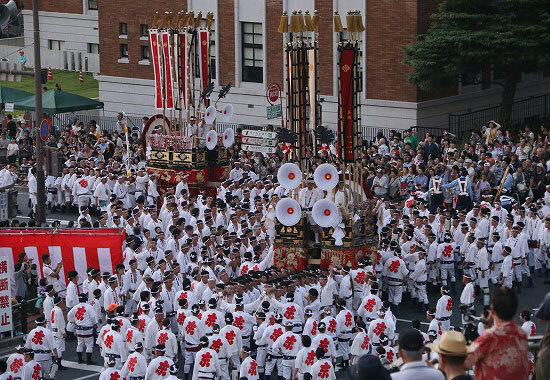 The chochin oyamagasa pyramids are about 10 m high, weigh 2.5 tons, and are courageously carried by around 80 people each keeping in step with the beat of the gongs and taiko drums of the hayashi musical accompaniment. The Tobata Gion Oyamagasa Competition is held in the middle of the day, with four oyamagasa and four smaller kowakayamagasa carried by junior high school students gather together in a scene that captures the hearts of onlookers.